Entertainment needs art, Art needs heart, Heart needs. . . It's a brand new day! It's a brand new project! C'mon peeps! 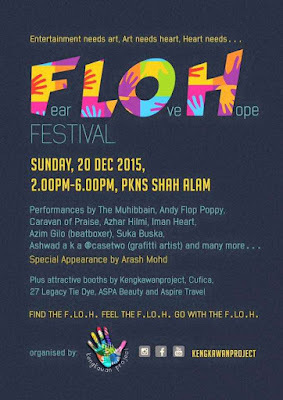 This coming Sunday (20 December 2015) @flohfest at Kompleks PKNS, Shah Alam. We all 'Go with the FLOH'. Special appearance by Arash Mohd. Plus attractive booths by Kengkawan Project, Cufica, 27 Legacy Tie Dye, Aspa Beauty and Aspire Travel.